As we all know, the Web serves many purposes to millions of users all around the world on a daily basis. From school children doing research in Senegal, to the youth chatting away in cybercafés in countries throughout Asia, each user has a specific goal he or she wishes to accomplish online. Among the most popular uses of the Internet, lies one which many can not ignore – eCommerce. According for Forrester Research, “US online retail reached $175 billion in 2007 and is projected to grow to $335 billion by 2012.” It goes without saying that with such a steep growth curve, it is within an organization’s best interest to invest in online commerce in an effort to create the best user experience possible. 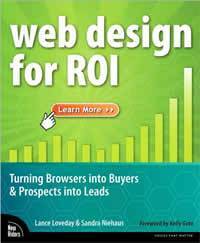 My latest read, Web Design for ROI, addresses design issues unique to eCommerce sites. Authors, Lance Loveday and Sandra Niehaus have divided the material into 10 easily digestible chapters which provide specific design guidelines for landing pages, home pages, category pages, detail pages, forms and the checkout process. Along with UI design issues, the authors include key metrics to look out for and provide resources for further reading. Although I am only seven chapters into the book, I already feel like I’ve gotten my money’s worth from the purchase. It’s reference material like this that keeps designers at the top of their game and users whipping out their credit cards (even during a recession).